The buzz today is about dealing with those pesky mosquitos that devil us, especially during this time of the year. The Mosquito Away line of TVs being produced and marketed in India by electronic giant LG, has an ultrasonic component designed to repel mosquitos in it. Mosquitos are considered a major health hazard in India, where more than 10,500 cases of dengue fever were reported in New Delhi alone. You might want to look into getting one of those TVs, especially if you're a couch potato! Other ways of getting rid, or coping with mosquitos, is to wear clothes that are designed with biting insects in mind. Bite-proof clothing is generally sold in sporting goods stores. Just keep in mind these bite-proof clothes are often treated with repellents (DEET) or poisons (permethin). Another way to combat certain species of the little blood suckers is to not wear dark colors such as black, blue, and red, which can make mosquito season tough for gang members! Another trick: avoid mosquito prime time. Dusk, dawn, and during darkness - these are the times when most mosquitos feed. This may come as a rude shock, but did you know that Citronella candles are no more effective at keeping mosquitos away than regular candles, which also produce heat, moisture, and carbon dioxide that draws mosquitos to people? I'm all for natural responses to mosquito attacks. Here's a good article about 13 natural ways to keep mosquitos away. 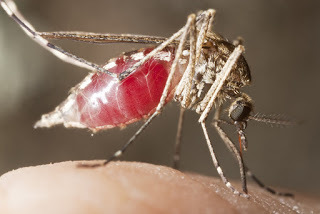 One more helpful article: What Attracts Mosquitos and How To Repel Them. Meanwhile, I'll be trying to figure out how to order one of those Mosquito Away TVs!